This Demonstration illustrates the Blaschke–Liebmann theorem: Let be a polyhedron combinatorially isomorphic to the octahedron. Color the faces of red or white so that every pair of adjacent faces has a different color. Then is infinitesimally flexible if and only if the planes of four red (or four white) faces meet at a point. In this Demonstration, a sphere is centered at the intersection of the planes of three red faces, and another sphere is centered at the intersection of the planes of another three red faces. A polyhedron is infinitesimally flexible if these two spheres coincide. The octahedra here are the two Bricard's flexible polyhedra and Wunderlich's jumping octahedron. For Bricard's octahedra, the spheres coincide for some interval of the angle, since the polyhedra are flexible. 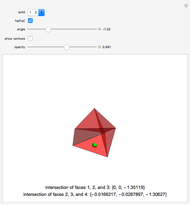 Wunderlich's polyhedron has only one value of angle for which it is infinitesimally flexible. Rotate the images to convince yourself that the centers of the spheres lie on three (or four) planes of the faces. 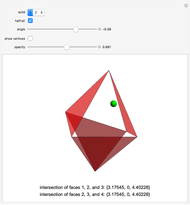 Definition: let be a polyhedron with triangular faces and vertex set . An infinitesimal isometric deformation of is a map such that at for all edges of [3, Definition 2.1]. This condition is equivalent to . A polyhedron is infinitesimally flexible if it has an infinitesimal isometric deformation in which some of its dihedral angles change. P. R. Cromwell, Polyhedra, Cambridge: Cambridge University Press, 1997 pp. 222–223. M. Goldberg, "Unstable Polyhedral Structures," Mathematics Magazine, 51, 1978 pp. 165–170. I. Izmestiev, "Examples of Infinitesimally Flexible 3-Dimensional Hyperbolic Cone-Manifolds," Journal of the Mathematical Society of Japan, 63(2), 2011 pp. 363–713. projecteuclid.org/euclid.jmsj/1303737798. Izidor Hafner "Infinitesimally Flexible Octahedron"